I think I can say officially now that winter is over and summer is here. School's out, and after a week of rain we had a warm and sunny day today. Which means, glory hallelujah, that my annual struggle with SAD is gone. My eyes pop wide open at 6:30 a.m., before the alarm clock rings, and I have energy to do things like scrubbing the daylights out of the north 1/3 of the porch (we have a big porch) and defrosting two freezers, all of which I did today. The boys had their friend Trenton over, and they took the canoe down the creek--around curves and under railroad tracks and around fallen trees, clear down to Bob Schrock's place. I love summer. And summer in Oregon, with its dry sunny days and cool nights and wandering creeks and whiffs of grass in the air, makes you forget the long damp gray trial of winter. "Counting Pigga and Katzie we have ten people in this house." Paul is lying on the couch reading. Dorcas and Emily are on the loveseat. Emily is reading the comics, particularly For Better or For Worse. Em: So who do you think Elizabeth will end up with? D: Um, who are the choices by now? E: There’s Mr. Wright, and the helicopter guy, and Anthony. D: Well, I always liked the helicopter guy. E: You did!? I always thought he was so fat and pompous. D: But he came and gave her a ride. That was cool. She dated Anthony in high school, right? E: Yeah, and then he married Therese, and then they divorced. D: Well, I for sure don’t want her to marry Anthony! E: Why not? Cuz he’s divorced? D: I’m kidding, ok? Your dad has a million freckles. I like freckles. D: Listen, he has so many freckles they look like a solid brown. E: Well, I think Anthony is nice. D: He has a bristly moustache. I just never liked him. E: What was he like in high school? D: From what I remember he was just this typical immature high school guy. E: Kind of like Gerald? At this point Paul and his book begin to jiggle and shake as snorts of disbelieving laughter escape his nose. He does not get the ladies in his life and how they take comic characters’ lives so seriously. Well, too bad for him. If Elizabeth marries Mr. Wright, it's fine with me. He's nice too. But pleeeease not Anthony. "Emily is the drama queen of the family except when Ben has to eat green beans." It so happens that I have been thinking along these same lines myself recently. A friend of a friend went to a writers conference, I was told not long ago, and there they heard Erma Bombeck's husband and children talk about what life with Erma was really like. I thought, hmmm, what would my husband/kids say in a similar situation? I think my family would say, mostly, that the stuff I write is accurate. But they know that there's plenty that I don't write about. What isn't accurate is the conclusions people draw from the relatively little information they have. In my newspaper column, I write about 1200 words a month. Well, believe me, you can describe only the teeniest slice of life in a family of eight in 1200 words a month. Yet regular readers feel like they know every detail of our lives from these monthly bites. Since I like to write essays where everything is tied in a neat bow at the end, I choose a topic where things actually turned out. For instance, if you recall, the story of the two cats and how we ended up keeping them indoors. A friend of mine wrote to me after that and said that my life must be full of tidy endings, or something like that. Well. That was one tidy and happy ending among a hundred loose ends and unresolved situations that month. I suppose I blog about 1000 words a week. Again, that lets me be very selective with the topics and details. I recall reading that the old Jewish scholars would interpret the Scriptures by what was written, and also by what wasn't written. And that was why it was said of Melchisidec that he was without beginning of days or end of life, or father and mother--because these details were left out of his story, and that was taken as significant. There is a delicate balance here between not enough honesty and too much. There are difficult people in my life I won't be able to write about until they die. There are church situations that would be gratifying to the flesh but completely wrong to expose to the world. There are faults and sins of my own that I don't care to publish. When I have to throw up, I shut the bathroom door, turn on the fan, and flush it away when I'm done. You don't want to be there. If you're a very very close friend or sister, I'll let you be there, maybe, to hold my head and hand me tissues. Just because you have never seen me throw up, doesn't mean that I never do. And believe me, you don't want to see me throwing up in print either. "There's something I've always "wanted" to do but it was against my better judgment, you know: Set an alarm clock for 12:00 and hide it in the pulpit." After I got my free potatoes the other morning, a stream of vans with frugal housewives drove back behind Steve's storage building all day and helped themselves to potatoes. I figured they must be all gone by today but then this evening Paul said there's still a bunch there. So I biked over to see for myself. He was right. There were probably 300 pounds or more still lying there, unfortunately starting to go bad from lying in the sun. And half a dozen Mennonite women were bent over, sorting out the good ones and bagging them up. I called out, "Looks like somebody's having fun!" as I pulled up. And they all looked at me, and one said, "Now don't go putting us in the newspaper!" Oh dear, is everyone that crosses my path paranoid that I'll write about them?? Really, I try to be careful, but after all my job is to write about my life, and if you are a part of my life and do or say something interesting, how can I help but want to write about it?? Incidentally, the question I am asked most often about my column is, "Do your children mind if you right about them?" My answer is two-fold: a) No, for the most part they don't mind. In fact they're very blase' about it. Someone will say, "Ooooooh, I saw your name in the newspaper today!" and they'll say, "Oh, is that right. Hey, did you hear that Kellen Clemens was picked in the second round?" b) They always have veto power over anything I write about them, before I send it off, although I have been known to bribe. We also have veto power over the stories Paul uses in his sermons, although when he was ordained I told him I am willing to be embarrassed for the sake of a good illustration. Maybe God knew our family would be under the microscope and gave us special grace to deal with it. And I must add my favorite quote from Anne Lamott: "If people don't like what you've written about them, they should have treated you better." "Yay! I finally got the chest hairs!" --Steven, when I gave him a haircut on Friday night, and a bunch of little round black hairs were sprinkled across his chest. Why do all my children want to grow up so fast??!! My husband is one of these people who cannot proceed with a conversation if one little detail doesn't sound accurate. It snags him like a blackberry vine on a knit skirt, and won't let go until this is thoroughly examined and picked apart, and by that time you've forgotten that you actually came out here to pick blackberries, so to speak. Last night I was relating something that a woman I know had told me, about her son who six years ago at age 24 did something I thought was rather remarkable but won't elaborate on here. And Paul interjected: "What? 'Jess' is 30 already? Come on. Ok, let's see, he's just older than 'Bill,' and 'Bill' is just older than Byran. Well, maybe, but I still don't think..."
We ended up pulling out an old church directory and checking dates. It turned out 'Jess' is 29 but turns 30 this year. Then Paul was ready for the rest of the story but I had little interest in telling it any more. He has passed this trait to his children. Recently I was talking to a woman who with her husband co-pastors a church in Springfield. She told me how, the first time she baptized someone, she was told she had to wear these big chest waders. They were made for a big man, and she is 5-feet-3, so when she stepped into the water, she started floating. Someone had to stay outside the baptistry and hang onto her wader straps to stabilize her. I found this amusing and told it to my family. I was met with a chorus of skepticism. "She floated?? Oh come on." "Wouldn't she have known she'd float as soon as she stepped in?" "Well, maybe she stepped in one leg at a time, and if you just put one leg in the water you wouldn't float yet." "There were probably steps to get in and the deeper she went the more floaty she was." "But still, I can't imagine she actually floated!" I said, "That wasn't the point. So maybe she was just unsteady on her feet and she called it floating. I just wanted to share an amusing anecdote with my family that I love so much and want to communicate with, and it all blows up in my face." Somebody come give us some marriage/family counselling. P.S. I just realized there is actually one advantage to my family and this trait of theirs, exasperating as it is. Remember recently there was a big brouhaha about this guy who wrote his memoirs and it turned out a lot of it was presented as fact but was actually embellished or fabricated? Well. No such fears with my book. With this crew looking over my shoulder, I'd better get the details right or I'll hear about it mercilessly. In fact, when I first wrote the column about the grass-seed harvest, Paul and I locked horns over one phrase. I wrote that when the cleaner is running, the warehouse "shakes and rumbles." He said, "No, it does not. It vibrates and hums." Finally, we compromised. If you look on page 43, you will see that it now vibrates and rumbles. This morning Paul was talking to his nephew Randy and was told that a truck came to the pellet mill with about a thousand pounds of potatoes that for some reason had not been dropped off at the previous stop. So. Free potatoes. I swooped in, vulture-like, and got two big sacks. Meanwhile, my spiritual-gift-of-giving SIL Bonnie racked her brain for people who are struggling financially and could use a boost like this. God bless Bonnie and all the folks who think of others before themselves. "Which would you be more surprised, if I came to school with an earring or red lips?" I just got done preparing my 10-minute talk for the Oregon Christian Writers meeting on Saturday. I am going to talk about words. Isn't it amazing that through sounds from our mouths or little black lines on a page, people can understand your feelings, laugh with you, know what you're experiencing. I think words are a gift from God*. Me: Jenny, do you have to talk so much? Jenny: Well, I just wanna be a good conversationalist. Me: Good conversationalists listen more than they talk. Jenny: (wicked grin) Then you be a good conversationalist! In the last few days I learned of the deaths of two special people. They were different in many ways but I will remember them both for the simple fact that they loved others. After I graduated from high school I moved 60 miles away to teach in a little Amish school. Actually, they had cars, but in many ways the families were not far removed from the Amish. I boarded with the bishop, Noah, and his wife Fannie. Noah and his first wife had raised a large family and then his wife died. Several years later he married Fannie, who was 20 years younger than him. I found Noah an exasperating man, very set in his opinions, such as the belief that men never went to the moon (it was all staged somehow) and the sun revolved around the earth. He felt it was wrong for me to pop zits on my face because it was altering how God made me. He had been a stern Amish bishop in his day and still had that grim and authoritarian aura about him. Fannie, on the other hand, was plump, jolly, and lots of fun. I had a rough time of teaching that year, mostly due to my own idealism and inexperience, and she loved me through all my mistakes. She didn't have any particular gifts that I can think of beyond the profound skill of nurturing everybody and everything that came across her path. She loved Noah despite his faults and made sure he swigged a little glass of aloe vera juice every morning for his health. She made tons of Christmas candies and pushed them on me until February. And every morning she cooked up a big pot of oatmeal and then took it outside to feed the animals, a big collie named Tanner and a bunch of cats. "Tanner! Tom! Tab! Fluff!" she would call, in her Pennsylvania-Amish accent, as she spooned the oatmeal into the trough. My brother informed me yesterday that Fannie passed away last week. What a gift she was. On Saturday, we lost Paul's uncle Rudy. Paul's aunt Allene was a stereotypical old-maid schoolteacher for many years. Brisk, independent, strong, outspoken, busy, professional. She wore her hair slicked back into a bun and gave off an aura of not being afraid of anything. Then during one of our last years in Canada we started getting a flurry of letters with the most amazing news. Allene was...dating! Allene was...in love! Allene was...carrying on like a schoolgirl! I feel I have a big imagination but this one was beyond me. Many years before, Allene had taught at a Navajo reservation in Arizona with a woman named Kay Klassen. Kay died of cancer some years later, and some years after that, Allene went back to Arizona for a reunion. There she met Kay's widower, Rudy. Sparks flew and before we knew it, they were dating! Then getting married! In Hawaii! On the beach! Allene and Rudy lived at his home in Sedona, Arizona. We really didn't see them that often but when we did I was always amazed at Rudy. He always had a twinkle in his eye and radiated an amused benevolence to everyone around. He was really quiet but didn't seem fazed by the noisy exuberance of Allene's family. Rudy brought out a side to Allene we had never seen--a feminine affection. She was in love with Rudy and that was that. Allene still talked as much as ever, and sounded just as strong in her opinions, but she would punctuate her speeches with little asides: "Isn't that right, Rudy?" And he would smile and nod in great amusement. She would rattle on, then turn to him again, "Isn't that right, Rudy?" Again he would smile and nod. I am sure Rudy had many accomplishments but I don't know what they were. I just know that I always felt that he loved me and all the rest of us simply because we were part of Allene's family, which is a rare and wonderful thing. --He loves God and lives like it. --He is an action guy and gets things done. --He is a solid rock that gives his family security. --He is proud rather than annoyed or jealous if he goes to a hardware store and the clerk asks him if he's "Dorcas's husband"
Amy is taking a writing class at Linn-Benton Community College, and one of her assignments was to write about a family tradition. This was the result, and I wanted to share it with you even though it's lengthy because in my utterly unbiased opinion I thought it was wonderful. Five years ago, my dad, who is a pastor, received a monetary gift from an anonymous church member. Knowing his children’s love for sports, especially Oregon Duck football, he decided to use the money to take any of his children who wanted to go to a game. Every year since then, we have selected one game every fall to attend. It has become a tradition, something that we look forward to each year as soon as the first hints of fall and football season come into view. Through the experience of interacting with each other, celebrating and sighing together as our team pulls ahead or falls behind, and making fun memories, we draw closer together as a family. The long-awaited day begins with the newspaper. Ben, age 12, has been up for hours and has almost memorized the sports section, so he reluctantly relinquishes it to me when I finally make my way downstairs. I scan through it, discussing it with Ben as I go. We talk about the Ducks’ chances, what the odds-makers are saying, and the opposing team’s outstanding linebacker. When we are done perusing our newspaper, we drift away to other things. Ben, sequestered in his room, listens to sports talk and checks up on other games on the radio. I eat breakfast and then curl up with a good book. The game doesn’t start until 4:00 p.m., so we have plenty of time to kill. Finally it’s 2:00, and we all head out the door. We are a smaller group than some other years. Matt has decided that he’s too old for this. Emily is sick and can’t make it. Jenny is too young to enjoy it, and Mom isn’t really into football, so they stay home, as usual. That makes four from our family: Me, Ben, Dad, and Steven. Although he’s almost 11, Steven has been part of our family for only ten months, and we are looking forward to introducing him to his first football game. After a 40-minute drive through traffic decorated with green-and-yellow flags and stickers, we reach our destination: the parking lot where fans can park free. The only drawback is that we have a fifteen-minute walk ahead of us, but it’s part of our tradition, so we don’t really care. We follow the crowds over a footbridge, through a park, down the sidewalk, and suddenly there is the stadium, looming huge and dark ahead of us. My first glimpse of the inside of the stadium always astounds me. We walk through a short tunnel, and suddenly we are part of the huge, bustling scene. Thousands and thousands of fans line the sides of the bowl-shaped stadium. People find their seats, settle in, or go off to find some food. On the field, the players go through their drills. It’s not raining, and the air is full of excitement: it’s going to be a great day. The game starts, and Ben and I are completely immersed in the action. When the team falls behind, we both sit tense, fists clenched in our laps, pleading with them to come back. When they score, we leap simultaneously to our feet, clapping, screaming at the top of our lungs, and jumping up and down. We pause to high-five each other, and then start screaming again. Steven claps and cheers too, though he seems a little lost. He is excited because we are excited, but he doesn’t quite understand what is going on. Nonetheless, he is making the most of this opportunity, and enjoying himself. In the midst of all the excitement, my dad sits motionless. He only stands when the national anthem is played, and never cheers or yells. To watch him, you would think that he didn’t even care about the game being played out in front of him. To a certain extent, that is the case. In the state of Oregon, where we’ve lived for the past ten years, there are two major college football teams: the U of O Ducks and the OSU Beavers. Nearly every sports fan in the state likes one or the other of the teams, but almost never both, and the rivalry between the two teams is so bitter that their annual game is aptly dubbed the "Civil War." My siblings and I became Duck fans almost by accident. Our geographical location, the preferences of our friends, and the biased reporting of the local newspaper sealed our fate. My dad, however, has taken the opposite position. Ever since he was young, he has supported the OSU Beavers. The Beavers’ stadium isn’t much farther away than the Ducks’, and the tickets are about the same price. It would have made sense for Dad to just take us all to a Beaver game, especially since he was using his own money. But he didn’t. After the game, Dad takes us all out to eat at McDonald’s. As a family of 8, even fast food gets expensive, and usually we are allowed to order only from the dollar menu, with large drinks and fries for everyone to share. This time, however, is a special treat, as Dad generously offers to buy us whatever we want. As I bite into my grilled chicken sandwich, I glance up at my dad. He is in the middle of a discussion about whether the Ducks will win their next game, and there is a little smile on his face. It is a happy, contented smile; a smile that says he knows the true meaning of family, self-sacrifice, and loving others more than himself. A long time ago I wrote about trying to find black Band-aids for Steven. I looked in Rite-Aid and Safeway and Walmart, and I searched the internet. I even buttonholed an African-American man in Eugene and asked him. He didn't think there was such a thing. I didn't find any and figured they didn't exist. Then just recently Paul and Naomi left a comment that they had found some for me. They came in the mail yesterday. They are called Band-Aid Perfect Blend clear bandages. The pad comes in three shades (light, medium, deep) and the sticky part is clear. They sent the "deep" kind, which match Steven nicely. So now if he has a scrape on his nose again, we have a nice subtle bandage for him. Thanks, Paul, Naomi, and the wonderful world of blogs. Ben, the technical math guy, pulling a piece of plastic wrap off the roll: Mom, did you know when you get a new thing like this it has enough to stretch over ten football fields, end to end? Ben: Not including the end zones.
. . . is about redecorating the house. Today was the official debut of Ordinary Days. I spoke at the annual May women's luncheon at the Central Lutheran Church in Eugene and took 27 copies of the book along to sell. After my talk and the closing prayer I was greeted with every author's dream: a line of people with checkbooks in hand. They bought all 27 books I had along. "I didn't think I'd need nearly that many!" I exclaimed. "Oh ye of little faith," rebuked the next lady in line. So then they placed orders for more books. 52 more, in fact. I am flabbergasted, grateful, surprised, and bobbing like a helium balloon. This is fun. I still feel like I'm just pretending to be an author and one of these times everyone will figure that out, but meanwhile, like I say, it's lots of fun. "Oh, I do enjoy reading about you Quakers and your life out in the country." The other day I went grocery-shopping again. (Do I get anything else done, we wonder...) First I went to Grocery Outlet where they were out of the 99-cent Life cereal but they had these gallon cans of Ortega cheese sauce for $3.99. I figured rather than using Velveeta, Amy could use this along with hamburger, sausage, and salsa for her famous chip dip that she made for Matt's birthday party. And it would be a cheap(er) way to feed the invading hordes when the kids have friends over. So I bought six cans of it. And a sack of cat food. And shortening and mayonnaise and grated cheese and much more. And then they had these boxes of Lipton tea bags, especially for iced tea, that I just love to have in the summertime but they normally cost 3-something for a box of 24, and these were only 99 cents. So I bought 12 boxes. And got it all in the trunk of the car. Then I indulged in a raspberry volcano from the nearby espresso stand. And then I went to WinCo where I filled two grocery carts with sugar (25 lb.) kitty litter (25 lb.) 4 gallons of milk, 10 dozen eggs, lots more stuff for us, and a bunch of food for the hamburger lunch Paul wants to make for the invading hordes (youth guys) on Saturday. I have this unfortunate malady of getting lightheaded at times, especially when I have too much caffeine in my system and not enough water, food, thyroid hormones, or blood pressure. So this hit me while I was unloading my stuff onto the counter, and as I hoisted out apples and oatmeal I was telling myself, "Focus, focus, don't faint, don't faint." ...Ah, made it. Finally I got in the car and found my water bottle and drank a bunch of warm water and lay my head on the steering wheel until the world was balanced again. I drive home and we unloaded all this and put it away. And Ben said, "Uh, Mom, there's one thing I wish you would have bought and that's ice cream." And I said, "DO YOU REALIZE HOW MANY GROCERIES I BOUGHT TODAY TO KEEP YOU GUYS FUELED AND YOU HAVE THE NERVE TO TELL ME I SHOULD HAVE BOUGHT ONE MORE THING??!! AND FOR YOUR INFORMATION WE ALREADY HAVE TWO GALLONS OF ICE CREAM IN THE FREEZER!!" Paul being a loving gentle patient husband put his arm around me and told me he felt I was overreacting slightly. In retrospect, I was. Ben forgave me. But maybe the episode will have a bit of redeeming value someday when Ben's wife comes home from a long day of grocery shopping. Matt: From my perspective we're short on girls. Amy: Well, from my perspective we're short on guys! Ordinary Days--Family Life in a Farmhouse is a collection of essays and stories, most of which first appeared in my Letter from Harrisburg column in the Register-Guard. It is published by Good Books, known for the Fix It and Forget It cookbook line, and also for House Calls and Hitching Posts. 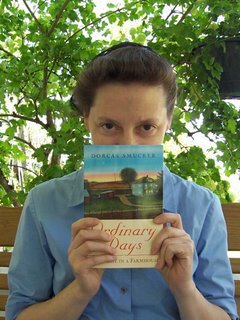 Ordinary Days is essentially the same book as my first one: Letters from Harrisburg--Ordinary Days. Five chapters (Yemen, Eugene Mission, Grandma and the Media, Quilt Questions, and FAQ's) have been omitted and replaced with later columns (Emily's Song, Aunts, Oregon Coast, Judgment Day, and Escapes). Being a good Mennonite, I will tell you bluntly that if you already have my first book you probably don't want to buy this one. Borrow a copy if you want to read the five new chapters. The book costs $9.95. I will be selling copies at book signings and such, but if you're not at my "events," Good Books prefers that you get a copy from your local bookstore rather than ordering it from me. This will greatly increase the chances of bookstores having a prominent display of Ordinary Days right inside the front door, which is what we all want. However, if you live next door to me or have a hard time getting to a bookstore, you can stop by for a copy or I can mail it to you. Thank you to everyone who has expressed interest and helped to spread the word, which is the best advertising of all. Me: (trying to sound like a teenager) Jenny, you just, like, did a really good job with that. Jenny: Um, Mom? When you say 'like,' you don't sound young; you sound...well...dumb.